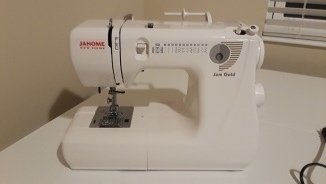 This compact machine weighs just 12 pounds and is perfect for taking to class, for RV travel, or as a starter machine for your favorite 'newbie' quilter. It features a drop-in bobbin, 12 stitches, and a built-in needle threader. The price includes: Janome Jem Gold 660 instruction booklet, power cord and foot pedal, small and large spool holders, screwdriver, walking foot, three snap-on presser feet [1/4" foot (O), overedge foot (C), zigzag foot (A)], a button hole foot (J), and two Janome bobbins. Machine used very lightly as I have trouble with computers. Extra purchases were: Walking Foot. $229.00, extra bobbins $20.00, a # 10 foot, and a straight plate $59.95.My total cost $5491.41 and will sell for $2300.00, or best offer over $2000.00. All instructions and tote bag to carry foot pedal and power cord. -Singer Featherweight Model 221 AJ 352616 1950 ....$350 $250. I am selling a Flynn multi-frame system for hand and machine quilting. It includes John Flynn's step by step CD. I am asking $75.